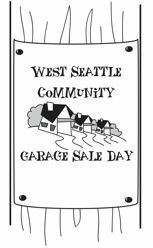 Registration is closed and it looks like we’ll have about 280 sales for West Seattle Community Garage Sale Day 2014 – maybe more, but we’re trying right now to reach more than a dozen people who went halfway through the registration process but didn’t finish it via PayPal. 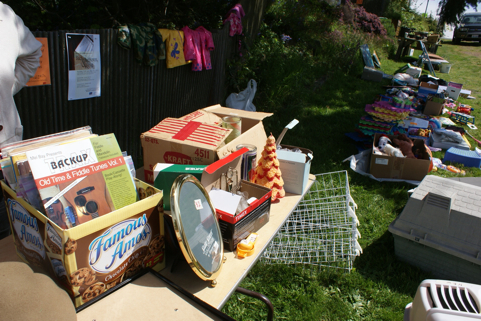 Without a complete registration, you won’t be on the map – so please make sure you have an e-mail receipt from PayPal, and if you don’t, please e-mail us ASAP – garagesale@westseattleblog.com. Also check your mailbox; we sent notes over the weekend to everyone for whom we don’t have a PP receipt. If you changed your mind mid-registration, no problem, but it would be great if you let us know. 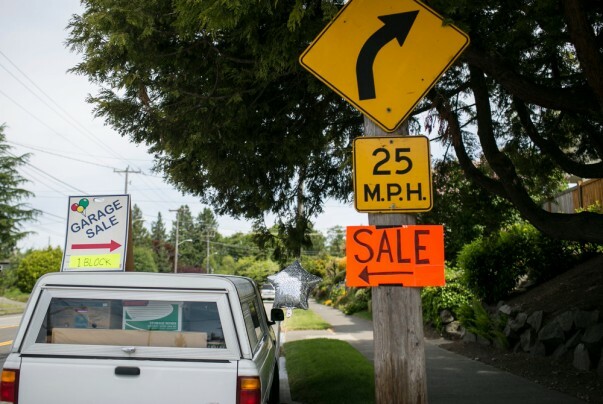 Now, a bit about the lineup: The heart of West Seattle Community Garage Sale Day is the web of individual sales all over the peninsula – more than 250!!! Beyond that, we have the group sites – Hotwire/Ginomai in The Junction, C & P Coffee to the south. 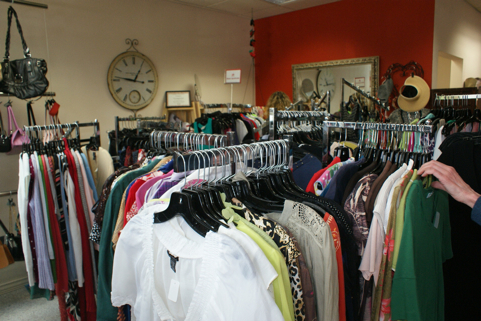 Sale day, again, is Saturday, May 10th, 9 am-3 pm. (Some sales may choose to start earlier and/or end later, but no late starts or early ends, please .) We are in the mapmaking process currently and if all goes well, we’ll link to the online/printable maps here and on West Seattle Blog, starting next Saturday, since our goal is always to get the map out a week in advance. With so many sales, we are advertising/promoting WSCGSD all over the region, but it also helps if you make sure your friends/relatives/co-workers know that this is THE day to come to West Seattle, shop the sales, visit local businesses while you’re here, sightsee, have a great day. More previews to come – including the “shopping list” for WestSide Baby, a request for book donations for students, and more. Seller Lori Freer, center, told Nick she made 5 times more money then she was thinking she would make. 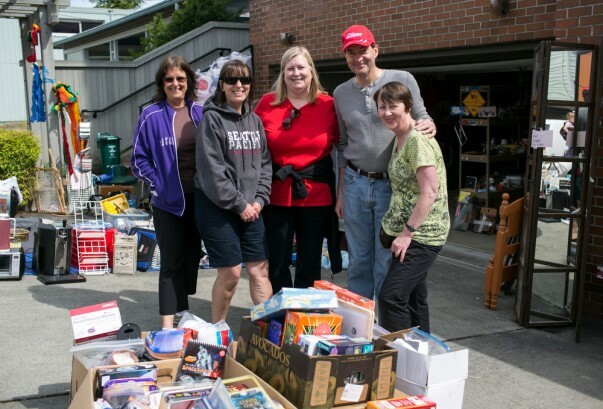 Above, from left, Sue Orr, Connie Kieling, Marsha Morris, Brian Baum, and Una Wilson, some of the crew raising money for the American Cancer Society at 4136 Beach Drive SW.
Fabio was offered for only $35 at Elisa‘s yard sale at SW Spokane and Beach Drive. 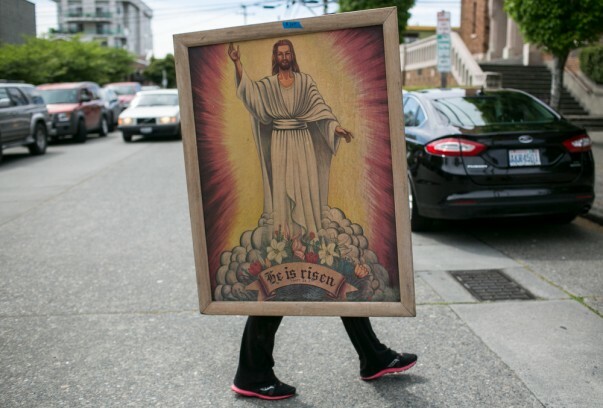 Grace Lybecker walks with a painting of Jesus that she purchased for $10. 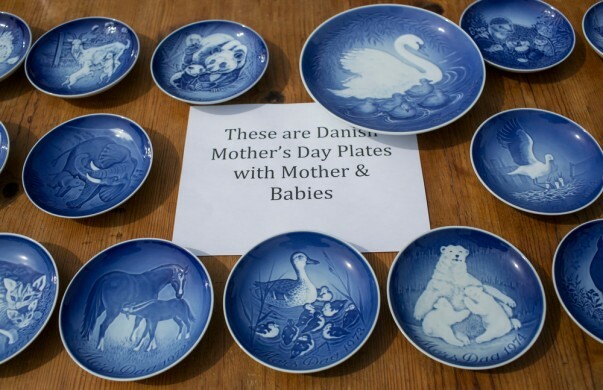 Danish Mother Day plates at 3633 Beach Drive SW. 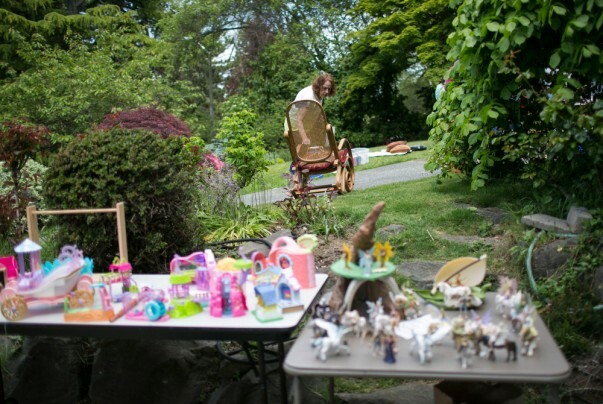 Items for sale at WSCGSD’s southernmost sale this year, the Cochran residence, in the 11400 block of 37th Ave SW.
A shopper checked out a rocking chair in Fauntleroy. 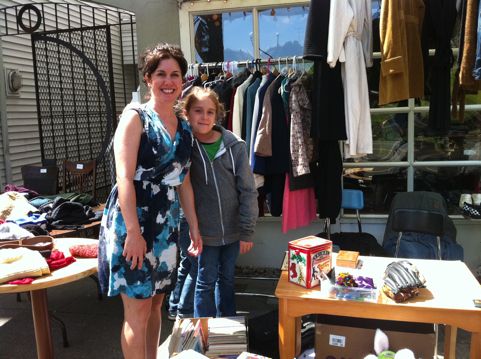 Bea Martin checks out the goods her friend Jay Atzbach found during the community garage sale. Nancy Kyle, right, talks with Ed Edgar, and his wife Jo, left, at a Morgan Junction-area sale. Thanks again, and we’ll see you next year – Saturday, May 10, 2014! We have running coverage on parent site West Seattle Blog, with photos and a list of map links right atop the story in case you need them (mobile included) – go here! Hope you are having a great WSCGSD! So excited. Are you? 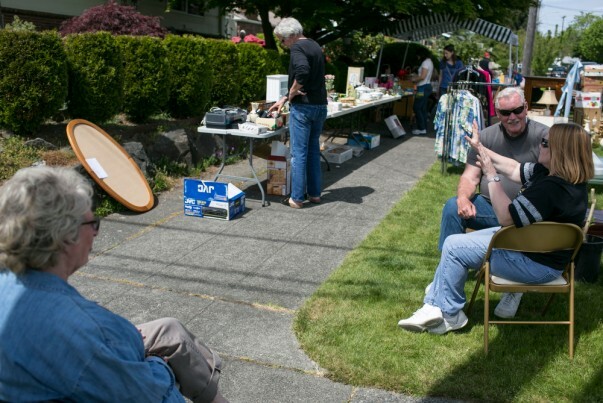 Remember, if you’re just happening onto news of this – West Seattle Community Garage Sale Day is NOT one big sale, but many, many sales all around West Seattle, 9 am-3 pm Saturday, May 11th. It’s the second Saturday of every year, and this year we have 280 sales of all sizes signed up – group sites, multi-family sales, benefit sales, and more. The list/map of sales is available two ways – a 14-page PDF with 7 pages of listings and 6 pages of map reference sections, and the clickable online map. Find them both here. And have a GREAT time! To crossreference with the address as you plan your stops, consult the WSCGSD map here. 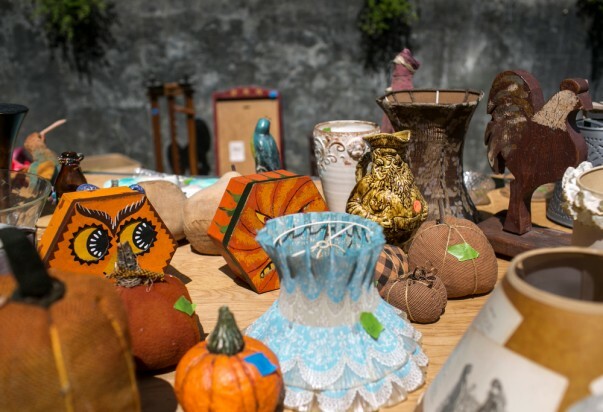 Only eleven days till Saturday, May 11th, with a record-setting 280 sales getting ready for the 9th annual West Seattle Community Garage Sale Day. *If you are a last-minute would-be participant looking for a group site, we now have three – the VFW Hall in The Triangle has some room at $5 donation/table. Not sure about room at the Hotwire Coffee and C & P Coffee group sites (we’ll be asking in a day or two) – check in with them to find out. 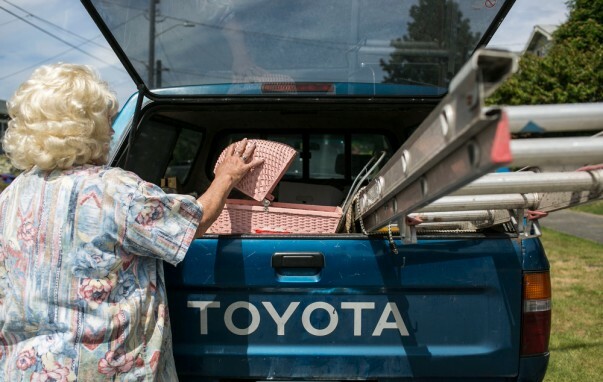 *This year, we have two partners for sellers to donate any leftovers – WestSide Baby and Northwest Center. WS Baby will have special dropoff spots, and NW Center as always is extending its Junction truck hours that day. Watch for full details and locations in a few days. *That info will be in the “packet” for sellers that we will e-mail by week’s end, along with other assorted notes, plus the template for you to print your “official participant” sign. *And whether you’re shopping or selling, please include Stamp Out Hunger in your plans – every year, this door-to-door food drive is the same day as WSCGSD (second Saturday in May), so just put your bag of donated nonperishable food out by your mailbox or door (if that’s where you get your USPS mail) first thing that morning! As for us, mapmaking mode continues for a few more days. WSCGSD questions? 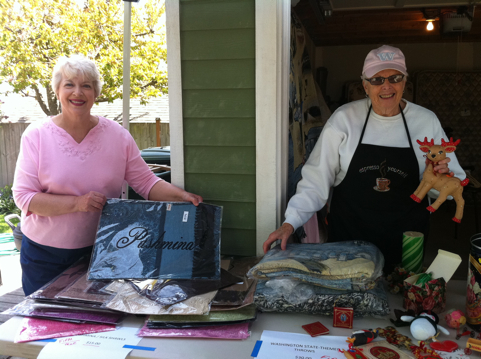 E-mail garagesale@westseattleblog.com – thank you! 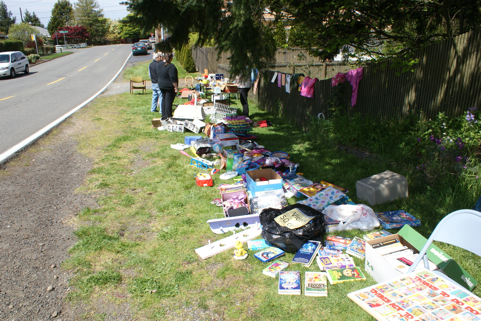 13 hours past closing time and we’re not sure we’ve recovered yet from West Seattle Community Garage Sale 2012. We decided to cover it as more of a travelogue (see the story and photos here), weaving a few contributed photos in with pictures we took while stopping at a dozen-plus sites … may not sound like much out of 245 but we were on the road continuously for five hours, with WSB co-publisher Patrick Sand driving, and hopping out to take photos and say hi, while your editor here (Tracy Record) kept downloading photos, writing, and updating the story from the passenger seat. By 2 pm, even our backup power was out, and we needed a little sustenance too, so it was back to the barn. 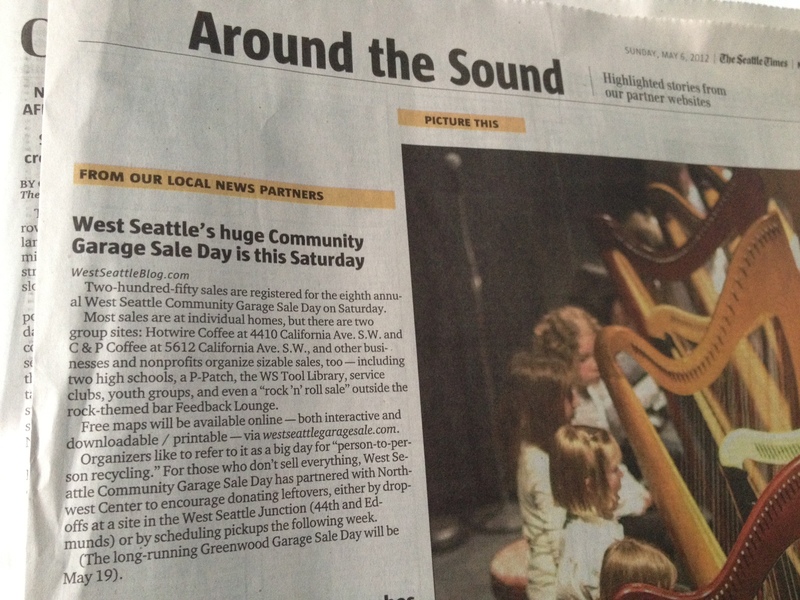 The post-sale reports have been fun to read, and it was fun to see that people were really were out and about browsing, buying, and best of all, mingling … while reading news on the Web (our main business) is generally a solitary pursuit, we do seek to support the community by promoting events and activities that get people out and about, interacting, and this certainly counts. Next year’s date – May 11th! 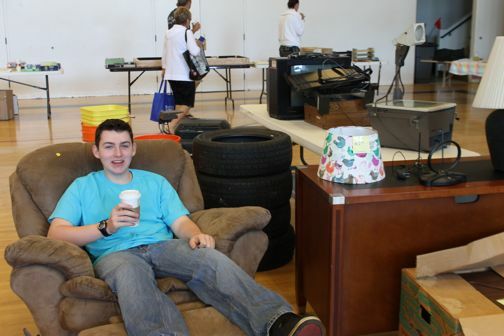 Inside the Menashe Family Gymnasium at Seattle Lutheran High School, big sale with great stuff including furniture – Tyler, who had helped do some of the heavy lifting, is checking out one of the recliners. Free tote bags, too. 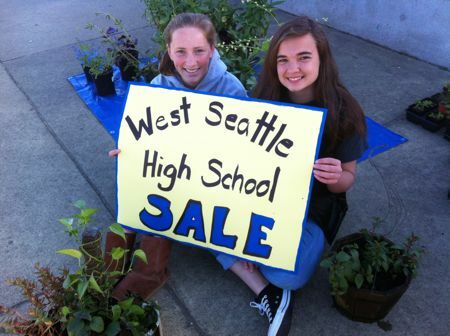 West Seattle High School girls’ basketball coach Sonya Elliott sent that photo from their sale site, #36, at the school (3000 California Avenue SW) – one of today’s benefit sales! 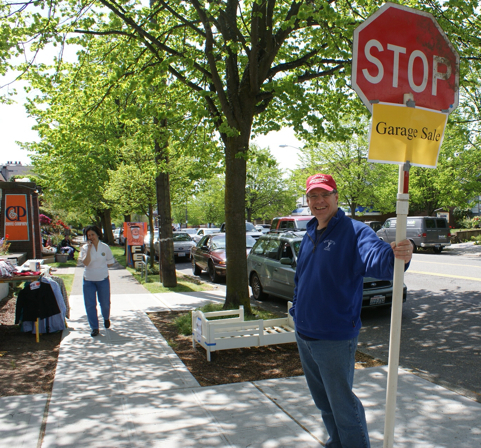 The 8th annual WS Community Garage Sale Day has arrived! One more time for people who just happen onto this site – the maps are here (note the link there to the PRINTABLE map and listings, as well as the online map you can use to pan, zoom, and click your way around – clicking any individual line on the right-side list OR any individual sale marker will bring up the “bubble” with its address and their short description). And sellers have been invited to post on the WSCGSD Facebook page – buyers looking for specific items too. TWO HIGH POINT SALES ON SW BATAAN NOW PROPERLY LOCATED ON ONLINE MAP: Our map provider uses data from Google and Mapquest, and yet it still couldn’t place SW Bataan in High Point in the right place. Sale #159 pointed this out, and sale #147 is affected too. Bataan is between Graham and Morgan, and both sales are within 2 blocks of each other, 2800 and 3000 blocks. OVERLAPPING MARKERS NOTE: On the printable map, we have topped the map-section pages with information about overlapping markers. 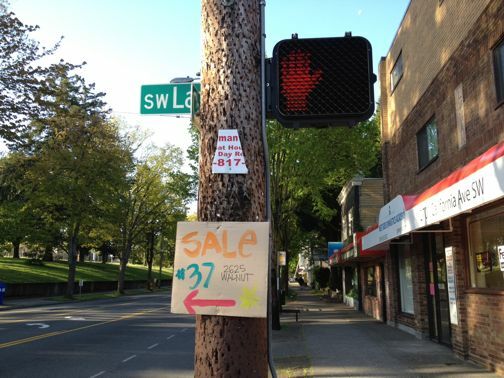 We have one error in this information – on page 3, it is correct that sale #57’s marker is under #125, but that is NOT because they’re both at Hotwire – #125 is the group sale at Hotwire but #57 is another big sale a couple doors down at the West Seattle Eagles’ aerie. The listing information for #57 in the text pages (it’s on page 7, second column) is correct, and on the online map too. (Note that they’re grilling burgers and hot dogs!) … Also, please note that marker #190 is behind #232. Sorry for the glitches – a few are unavoidable, and we try to keep it to a few – get ready for a great day tomorrow! ADDED LATE FRIDAY NIGHT: Sale 71 just canceled. 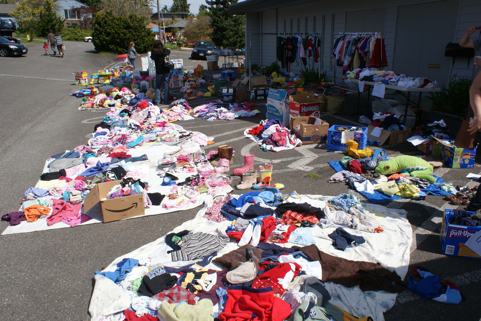 Today (Wednesday, May 2nd) is the annual GiveBIG donate-a-thon – and while we have published a list of local participants on our main site, West Seattle Blog, we did want to give a special shoutout to Northwest Center, which is the official “leftovers partner” for Garage Sale Day, and is based in southwest South Park, along West Marginal Way South. 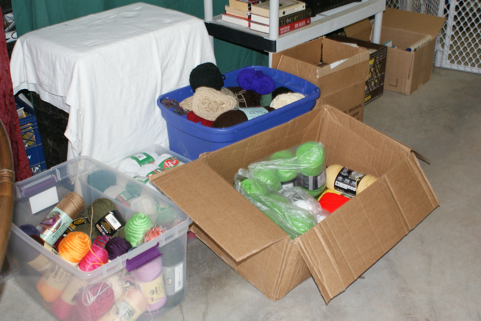 (Garage Sale Day participants will get info in the next few days about how to work with NW Center after WSCCGSD if you choose.) 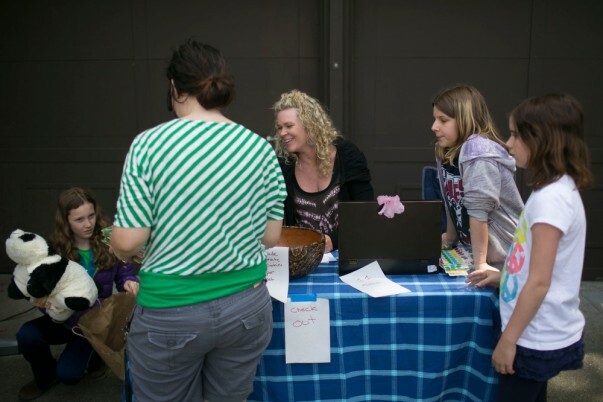 Before 11:59 pm tonight, your donation will stretch further, thanks to a “stretch pool” from sponsors of GiveBIG’s coordinating organization The Seattle Foundation, as long as you donate through the specific links on TSF’s site – here’s the one for NW Center. Beautiful day to be out along the sidewalk in the sun, between Alaska and Morgan Junctions. Lots of sales in Arbor Heights this time around. Including Sale #253 at 10455 42nd SW, benefiting West Seattle Community Orchestras, a nonprofit group for all ages and skill levels! 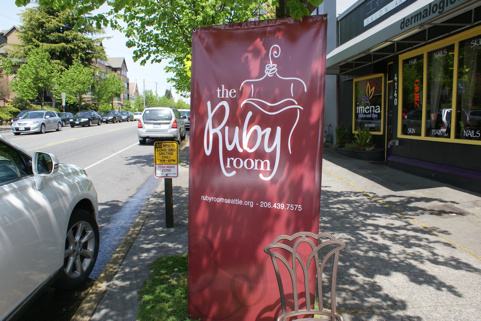 Sale #31is unique – it’s a $10 dress sale at Cherry Consignment on the north end of The Junction, to benefit The Ruby Room, At 4142 California SW, where proprietor Nyla says dresses have been flying off the racks – but still a good selection left, at least when we dropped by! From WSB contributor Ellen Cedergreen at Freshy’s Coffee across from Hiawatha on California – they’re going till 4. “Lots of books and DVDs. Very cool vintage clothes,” Ellen reports. In the photo are Carmela and Olivia. 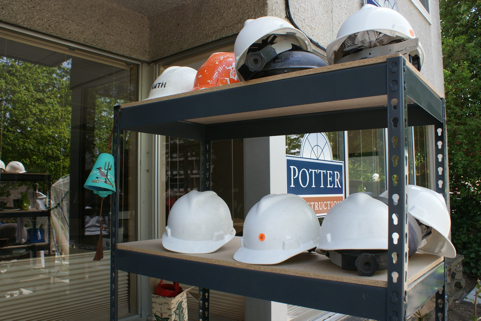 Perhaps no surprise that a construction company would have construction implements on sale during West Seattle Community Garage Sale Day – that’s Gary Potter from Potter Construction, which is hosting the Rotary Club of West Seattle‘s benefit sale at 5606 California SW. Hard hats too! 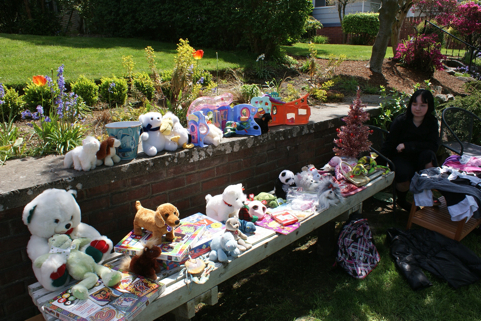 Books and more at this sale, 4030 55th Avenue SW, benefiting Amethyst Chapter #138, Order of the Eastern Star. We think this one is the sale with the largest number of participants – more than 100 families, if we recall correctly from registration, benefiting Arbor Heights Co-Op Preschool, which is part of the great network of cooperative preschools around the area. They promised some even-better deals after 1 pm, so if you see this in the last two hours of the sale, another reason to head south to Arbor Heights!